This postcard features a gorgeous field of our state flower, the Black-Eyed Susan, along with our striking flag blowing in the breeze. The back of the card has information about our state flower written in the upper left corner. 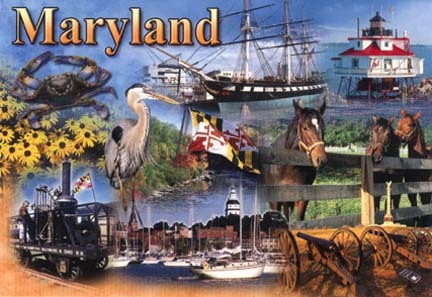 This postcard features a colorful collage of Maryland symbols and landmarks. The back of the card has Maryland facts written in the upper left corner. 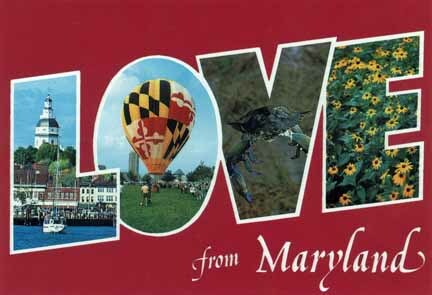 This postcard says "Love from Maryland" and features a collage of Maryland symbols on the front and on the back is a transparent duplication of the front image. 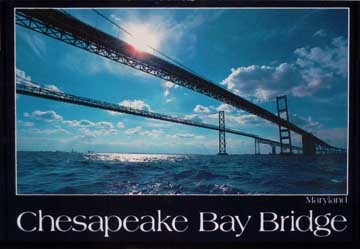 This postcard shows the twin spans of the Chesapeake Bay Bridge. The back of the card has facts about the bridge written in the upper left corner. 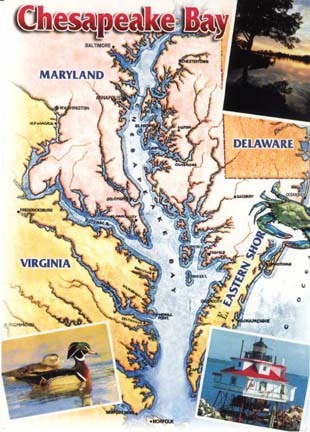 This postcard features a map of the Chesapeake Bay. The back of the card has facts about the Bay written in the upper left corner. 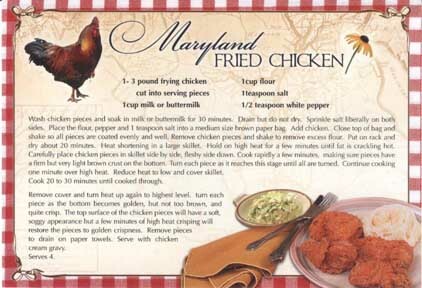 This postcard features a traditional Maryland Fried Chicken recipe. The back of the card has the recipe written in the upper left corner. 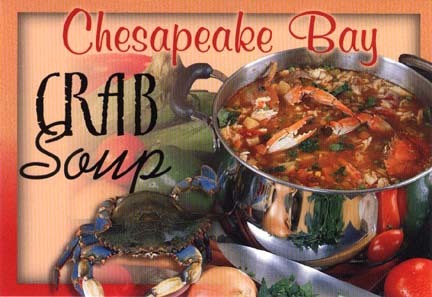 This postcard features a tasty Chesapeake Bay Crab Soup recipe. The back of the card has the recipe written in the upper left corner. 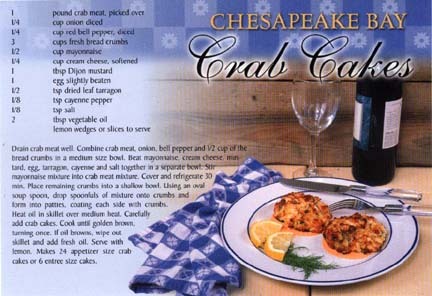 This postcard features a great Chesapeake Bay Crab Cakes recipe on the front. 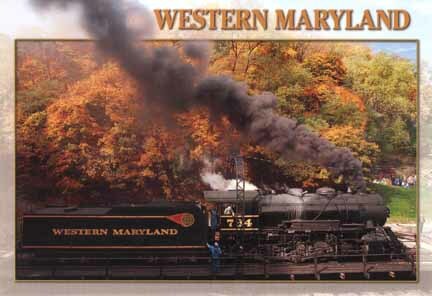 This postcard says "Western Maryland" and features the Western Maryland Scenic Railroad's steam locomotive. The back has a transparent image of the front photo and has facts about the locomotive and rail route in the upper left corner. This photographic post card shows historic Annapolis, Maryland's Capital, from an aerial view. 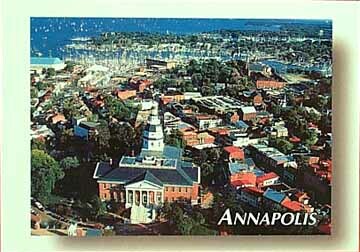 The back of the card has information about Annapolis in the upper left corner. 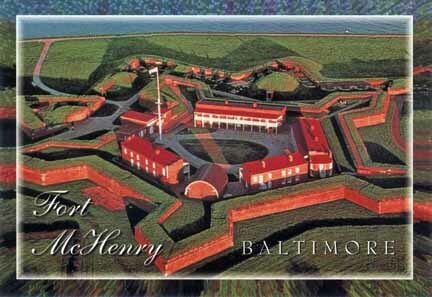 This postcard shows the home of the Star Spangled Banner, Fort McHenry in Baltimore. The back has a transparent image of the front photo and has facts about the Fort McHenry in the upper left corner. 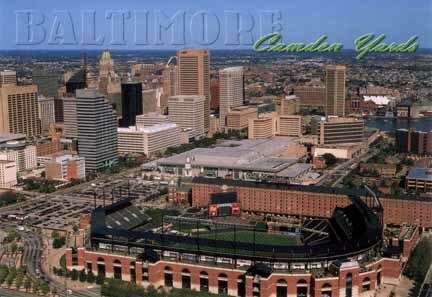 This postcard features Camden Yards, home of the Baltimore Orioles, with Baltimore's Inner Harbor in the distance. The back has a transparent image of the front photo and has facts about the stadium in the upper left corner. 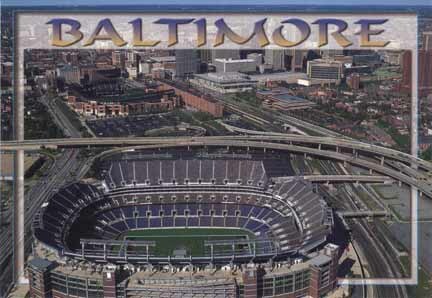 This postcard features the home of football's Baltimore Ravens with the Orioles' Camden Yards stadium in the background. The back has a transparent image of the front photo and has facts about the stadium in the upper left corner. This postcard shows Dunker church on the Antietam Battlefield, the scene of horrific fighting during the single-day highest casualty battle of the Civil War. 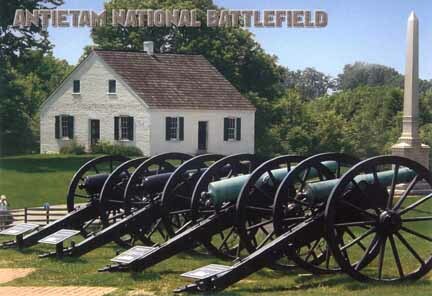 The back has a transparent image of the front photo and has facts about the Antietam Battlefield in the upper left corner. 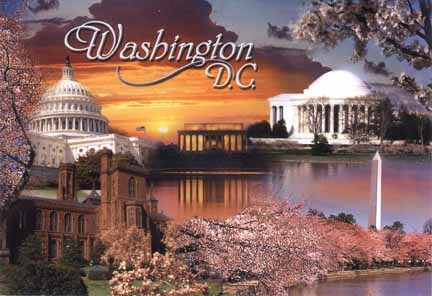 This postcard shows Washington D.C.'s famed cherry trees in full bloom along with a collage of notable landmarks. The back has a transparent image of the front photo and has facts about the cherry trees in the upper left corner. 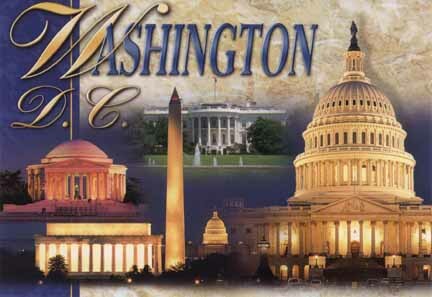 This postcards features a collage of some of Washington D.C.'s famous landmarks. The back has a transparent image of the front photo. 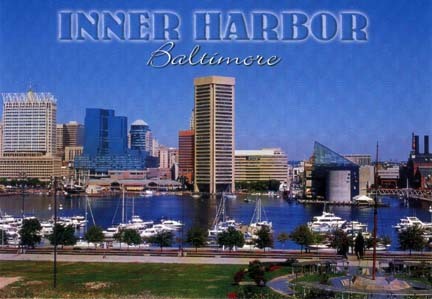 This postcard features a lovely scenic photo of Baltimore's famous Inner Harbor. The back of the card has facts about the Harbor written in the upper left corner. Note: postcard scene may vary from one shown. This white colored pencil has red crabs surrounding the word "Maryland". *The picture shows two pencils for display purposes. Pencils are $0.99 each. This pencil comes in assorted colors and has facts about Maryland printed on it. 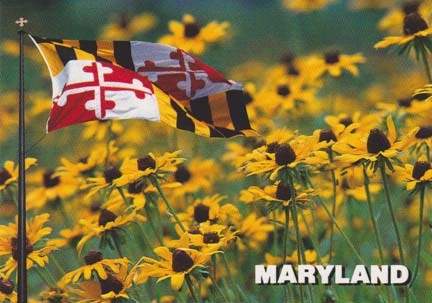 Shown and/or named on the pencil are: The Maryland State Flag, State Bird - Baltimore Oriole, State Flower - Black-Eyed Susan, State Song - Maryland My Maryland, Nickname - The Old Line State, and the Statehood Date - April 28, 1788. Color of pencil is our choice. *The picture shows four pencils in order to display assorted colors. Pencils are $0.99 each. 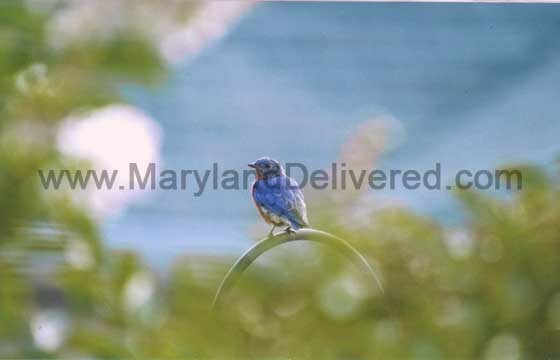 These popular outdoor or indoor stickers truly show your Maryland pride! 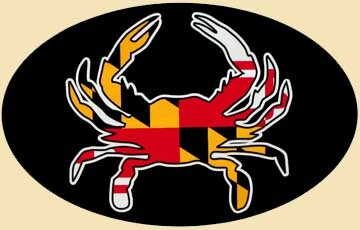 The sticker has a blue crab shape with the Maryland flag design on the crab. White border around the crab. Perfect for the home or on your car window or body. Tip: Line them up on your car or truck window to represent your family - large for dad, medium for mom, small for teens, and mini for smaller children. This magnet is in the shape of the Maryland state fish, the Rockfish (Striped Bass). The magnet has a Maryland Flag pattern with the word "Maryland" written in script. White/Shadow border around flag design. The thinness of the magnet makes it perfect for sticking on the car or on your refrigerator. 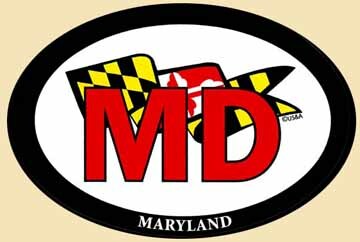 A great Maryland sticker! 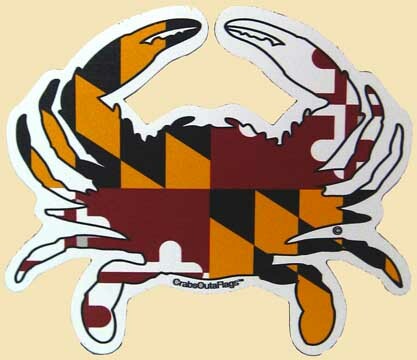 This sticker is the oval Euro style and has the Maryland Flag pattern in the shape of a Blue Crab. Great on car windows, your desk at work, dorm room doors or anyplace else you want make a statement. This Euro style sticker features Maryland's State Flag. Great on car windows, your desk at work, dorm room doors or anyplace else you want make a statement. 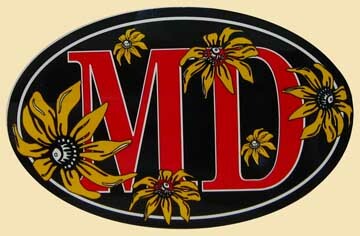 A Euro style sticker featuring Maryland's state flower, the Black-eyed Susan, along with the letters "MD". Great on car windows, your desk at work, dorm room doors or anyplace else you want make a statement. 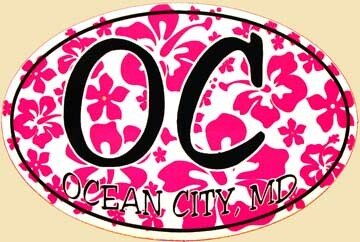 A colorful euro sticker featuring bright pink hibiscus flowers with "OC" and "Ocean City, MD". A great reminder of your summer vacations down the shore. Slightly larger than the average euro sticker. Great on car windows, your desk at work, dorm room doors or anyplace else you want make a statement. 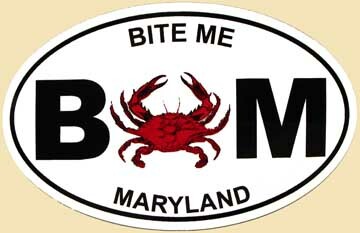 This euro style sticker features a crab with the letters B & M and the words "Bite Me" and "Maryland". This sticker is sure to let people know just how you feel. Great on car windows, your desk at work, dorm room doors or anyplace else you want make a statement. This oval euro style sticker makes a bold statement and includes a bright red crab in the background! 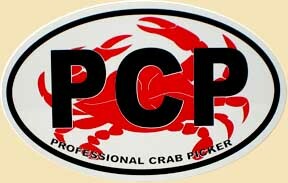 "PCP - Professional Crab Picker!". 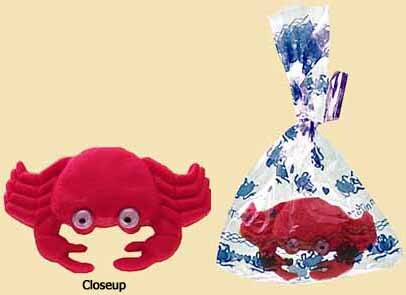 Great on car windows, your desk at work, dorm room doors and anyplace else you think of to show your crab pickin' prowess! Let people know just how you feel with this cute oval euro style sticker. 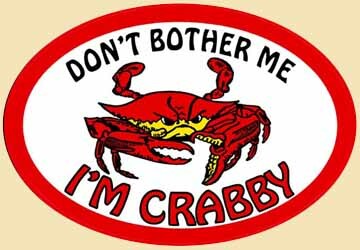 Great on car windows, your desk at work, dorm room doors and anyplace else that you want to declare "Don't Bother Me I'm Crabby"!!! 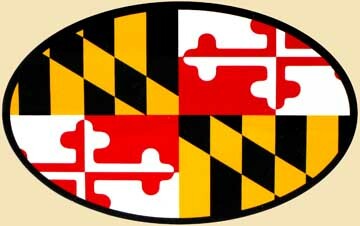 An oval Maryland banner flag euro style sticker. 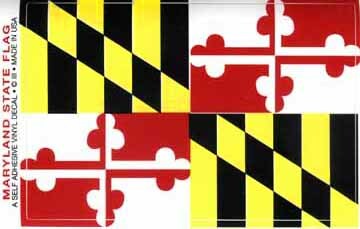 Great on car windows and anyplace that you want to show your Maryland pride! 4 7/8" x 3 1/4"
You can put this vinyl decal (sticker) on virtually anything. A great way to show your Maryland pride. A whimsical little pewter crab that can serve as a mini paperweight. 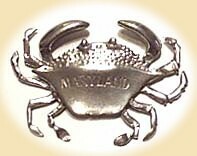 This generic crab is approximately 3" wide and has the word "Maryland" engraved on the top. Made by Salisbury Pewter. 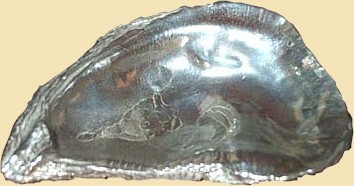 This realistic looking pewter oyster shell looks great in the home or at the office. Use it as a paperweight or as a holder for paperclips, change etc. It has a fine silver-like finish and has flat spots on the back so it will sit level. A great gift for oyster lovers! Made by Salisbury Pewter. 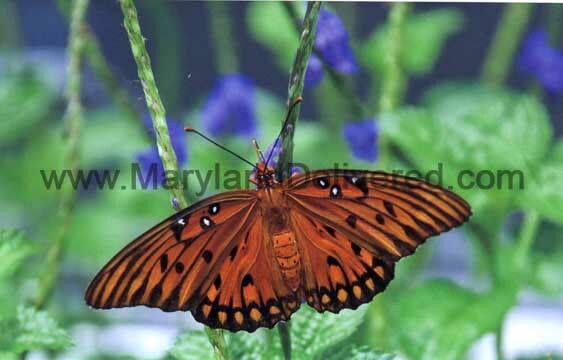 The Gulf Fritillary Butterfly is also called a Passion Butterfly. It takes its name from the flights of migrating butterflies seen over the Gulf of Mexico. The composition of this photograph is gorgeous! Envelope included. Blank inside with signature of photographer and title of photo on the back. Photography by S. Aprile of Easton, Maryland. 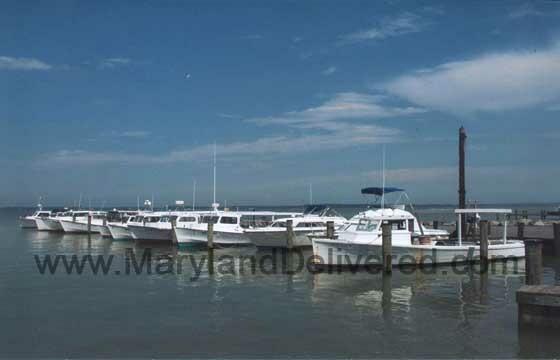 A calm day on the Chesapeake Bay and the workboats are lined up at rest. It must be Sunday! Envelope included. Blank inside with signature of photographer and title of photo on the back. 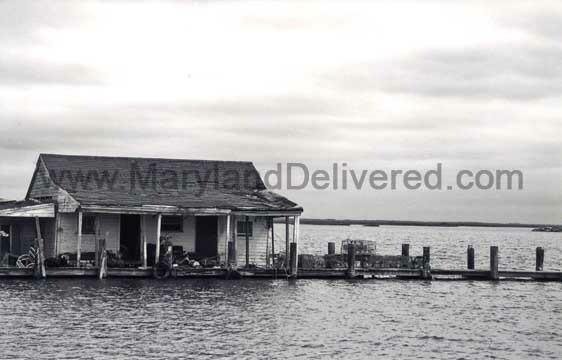 Smith Island, is Maryland's only inhabited off-shore island in the Chesapeake Bay. 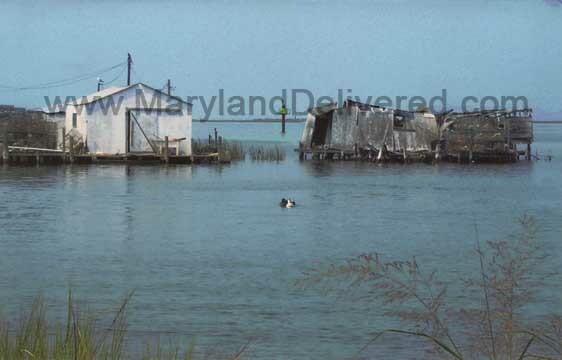 Most remaining residents make their living in the fishing & crabbing industry. Envelope included. Blank inside with signature of photographer and title of photo on the back. The only black and white photo in our group of note cards by S. Aprile. This is a quiet depiction of the not so glamorous life of a Deal Island waterman. Envelope included. Blank inside with signature of photographer and title of photo on the back. A lovely little bluebird bathed in light! Taken in the home garden of the photographer. Envelope included. Blank inside with signature of photographer and title of photo on the back.